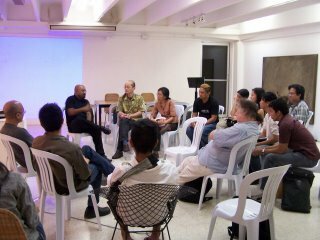 The Ateneo Art Gallery, through gallery curator Richie Lerma and independent curator Fatima Lasay, hosted the visit to the Philippines, the selection committee for the Ogaki Biennale 2006, organized by the Center for Media Culture, IAMAS and Gifu Prefecture, Japan, on Friday, April 7, 2006 in Ateneo. Present at the forum were committee members Gunalan Nadarajan, associate dean for research and graduate studies, College of Arts and Architecture of The Pennsylvannia State University, and Hiroshi Yoshioka, professor for media aesthetics, and director for center for media culture of the Intitute of Advanced Media Arts and Sciences in Japan. It was a rare occasion where Philippine-based multimedia artists gathered together for a day of style presentations as well as an intimate discussion on issues emanating from their own brand of art. New-media artists such as Tupada International Action Art conveners Ronaldo Ruiz and Mannet Villariba, instalation artist Yason Banal, joined by video-artist Tad Ermitano, and soundartist Jing Garcia of The Children of Cathode Ray, were among the presenters at the event.